Pandharpur Yatra is celebrate Gujarati month of Ashadh (Jun-july) Day of Eleven in Pandharpur Lord Vitthal temple Maharastra.Time to revive and relive the fervour of devotion to the God Vithoba of Pandharpur. Palkhi (palanquin), a unique feature of Maharashtrian culture, is a 1000-year-old tradition followed by the warkaris - people, who follow the wari (a holy ritual). They collectively go singing and dancing, chanting Dnyanba-Tukaram, Maharashtra's renowned saint-poets, in what are termed dindis, to the holy town of Pandharpur in Hindu months of Ashadh (June-July) and Karthik (November-December). The Palkhi starts in the month of Jyeshtha of the Hindu calendar. The procession and the religious celebrations last for almost three weeks. Every year on the 11th day of the first half of the Hindu month of Ashadh, the Palkhi reaches Pandharpur. A bit of history about the prevailing custom of Pandharpur fair goes likes this: In the year 1685, Narayan baba, the youngest son of Tukaram, decided to bring about a change in the mode of celebration. 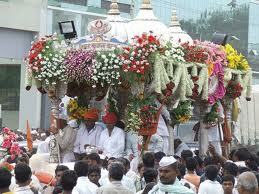 So, he introduced the Palkhi, which is a sign of social respect. There are several other nuances, which only a true warkari can fathom. With passage of time, the popularity of this ancient tradition has soared immensely. Tens of thousands of devotees proceed from Dehu village to Pandharpur, joined along the way by thousands more. The pilgrimage is mostly on foot from the countryside, carrying flags and festoons and singing devotional songs. The pilgrims come from all classes of society. The rich and the poor, the educated and the unlettered all go there in search of inner peace. Devotion to Vitthal transcends the barriers of caste, creed and religion. Myth has it that Pundalik, an earnest devotee of Vithoba, placed the service of his parents higher than to that of God. He commanded the violent Bhima River not to disturb his sleeping parents. Pleased by his devotion, Vishnu blessed him with a boon, and the river mellowed and now flows silently as the Chandrabhaga in Pandharpur. On appearing at Pundalik's doorstep, Vithoba found Pundalik with his parents sleeping with their heads on his lap. So as not to insult the Lord, Pundalik slipped a brick forward. Till date one finds Vithoba standing on that brick, waiting to be entertained by his 'host', at Pandharpur. Warkaris, oblivious of the sultry heat and thundering showers, join in the spiritual rendezvous. Most warkaris trudge their way to Pandharpur, accompanied by chanting, singing and dancing. Pandharpur attracts millions of tourists and pilgrims from all over the country converging at the town, for a holy dip in the Chandrabhaga. Over the years, Pandharpur has grown considerably. It now has a population of over one lakh. The town is undergoing rapid change with gardens, modern colonies and tourist infrastructure. The sight of thousands of devotees travelling from the nook and corners of the state, the reverberating sounds of the chants and hymns and the ecstatic joy of the ardent pilgrims on reaching the holy destination, makes the Pandharpur yatra a spiritual experience par description. The temple of Vithoba in Dehu is synonymous with turbanned devotees, pursuing their traditional pilgrimage routes across Maharashtra in a spirit of serene devotion. The principal shrine in Pandharpur is devoted to Vithoba (Vitthal), an incarnation of Vishnu. Although some popular literature states that the Vithoba Temple was built in 83 AD. However, available historical evidences indicate that it was constructed in 1228. Since the early 1980's, the Archeological Survey of India (ASI) has been doing extensive restoration work, reviving not only its historical and religious values, but also its aesthetic appeal. Pandharpur attracts millions of tourists to its 24 temples, eight bathing ghats and old-time palaces, including Holkar Wada and Shinde Wada. Festivities in July and Kartiki Ekadashi, find pilgrims from all over the country converging at the town, for a holy dip. The custom of taking out a holy procession is said to have started in 1810.